Matt Doherty’s exclusion from the Ireland side for last month’s Euro 2020 qualifier against Georgia should be viewed in a positive light for the national team, according to Enda Stevens. Manager Mick McCarthy could not find space for Ireland’s outstanding Premier League performer of this season for the clash against Georgia at the Aviva Stadium, with the experiment of playing the Wolves full-back in an advanced wide midfield role failing to reap rewards in the away win against Gibraltar four days earlier. 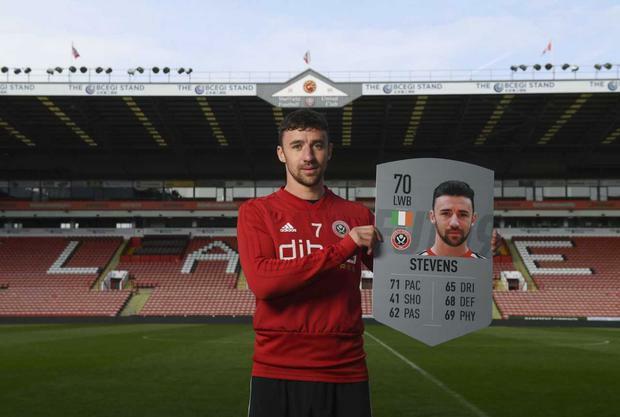 Sheffield United defender Stevens cemented his position as Ireland first choice left-back with two solid performances to open the Euro 2020 qualifying push, earning praise from McCarthy, who suggested he would continue in the role for the foreseeable future. Now Stevens has told Independent.ie that Doherty’s absence from the Georgia game is confirmation that the negativity around the Ireland team is misplaced. "We have a good team in there if we can get it right," he declares. "When you can’t get one of the best defenders in the Premier League into your team, it shows we have great quality in that area of the team and I’ve never doubted the quality in this squad. "The ability we saw in training sessions was always high when I have been away with Ireland and the quality of the standard of player was never an issue for me. The problem has been performing where it matters most in games and hopefully now we are going to turn that corner. "The message from the management team was to get after them, to be on the front foot and to do what Ireland teams have always done. We need to make life difficult for the opposition and force them into mistakes, get into good positions and up our goal rate. The manager kept emphasising the need to score goals and it was a very upbeat camp to be a part of. "The applause from the fans at the end showed that they appreciated the effort of the lads and the hard work we have put in." Meanwhile, Sheffield United centre-back John Egan believes ‘the buzz is back’ in the Ireland squad, after McCarthy’s arrival helped to change the mood with two wins to start his second spell in the job last month. David McGoldrick’s impressive performance leading the line sparked rapturous ovation for Egan’s Blades team-mate, as he suggested that moment captured a new atmosphere around the Ireland team. "Hopefully the buzz is back now and it can drive us on to qualify for the Euros," Egan told us. "We want to get the feel-good factor back into Irish football and last week was a great start to that. "That was the best Irish performance we have seen in a good while and I think that’s why Didzy (McGoldrick) got the reception he did when we came off. The fans were just happy to see the team playing some good stuff and we have to build on that now. "Didzy turned in as good a display as I can remember from an Ireland striker against Georgia and it is a tough job playing up there as the loan striker and having to put I a lot of work. "You could see after 75 minutes, he was literally out on his feet. He had given everything and there was nothing left in the tank for Ireland. "The main thing was getting the win and putting six points on the board, but the performance was the cherry on the cake and the lads deserve the standing ovation they got at the end." Irish International and Sheffield United teammates John Egan, David McGoldrick and Enda Stevens compare their FIFA Ultimate Team™ ratings at Bramall Lane, Sheffield. EA SPORTS FIFA 19 is available on Playstation, Xbox, PC and Nintendo Switch, head to https://www.easports.com/fifa to get your copy.